July was a huge month for the L2P Program, with a new pilot program starting in Robinvale. Thanks to an initiative from the Robinvale College Clontarf Foundation, learner drivers in Robinvale will now have access to the program one day a fortnight. L2P Program Officer Ross Palmer said he was thrilled to extend the program to Robinvale residents. “We were contacted by the Clontarf Program, who recognised there was a need a need to offer the program to learner drivers in Robinavle. “So we now have Leon Johnson and Travis Bussell from the Clontarf Foundation, along with Council’s Youth Support Officer Nellie Patterson as mentors for the program. In addition to the Robinvale program, L2P also welcomed a new major sponsor last month. 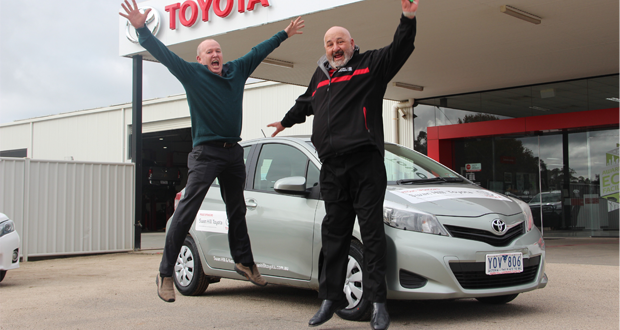 “We’ve just had Swan Hill and Kerang Toyota come onboard as our new major sponsor and they’ve generously donated the use of a Toyota Yaris for our learner drivers to practice in. Georgina Johnson was one of those eight drivers and said that as both her parents didn’t drive, the program was crucial in gaining the hours and experience she needed to get her probationary license. “I actually found out about the program from my older sister, as she got her license using the program as well,” Ms Johnson said. The L2P Program is made possible thanks to dedicated volunteer mentors, the program’s major sponsor Swan Hill and Kerang Toyota, and local businesses WDEA Employment, Murray Downs Golf and Country Club and Murray Mallee LLEN. For more information on the L2P Learner Driver Program, or if you’re interested in becoming a mentor, click here or contact Ross Palmer on 0427 182 241.